The Palio Expert 2 is the enhanced version of already obsolete Palio Expert 1. It is a new paddle that being added to the Palio paddle line. The selling price is very affordable for most of the people and the quality that you receive may well off for what you have paid for. Now, let’s do some reviews on this racket by finding out how good it is? What the player can benefit from this bat? It is worth the price that it asked for? Let’s take a look of the built of this Palio Expert 2 racket. The blade is built with all wood. It has been redesigned and further improves from its predecessor Palio Expert 1. The improvement has made the blade to be a better quality blade that can offer players with a better feeling. The paddle comes with 2.0mm for the thickness. You can upgrade it to 2.2 mm if you want to. The rubber used in this pre-assembled racket is the CJ8000. It is an ITTF approved rubber for tournament play. This rubber can offer players with good control, feel, and spin. This is because the rubber is constructed with a softer sponge. The top sheet is very tacky and you can play your game by generating a lot of spins. There are 3 different thicknesses of the CJ8000 rubber. The thicknesses that you can choose are 1.8, 2.0, and 2.2mm. While the hardness of the sponge is 36-38 degrees. The racket is having a flared handle. The design of the handle is very comfortable when you hold it in your hand. It has very good control. Most beginners may face the problem of their backhand stroke may sometimes not in pace with the ball hitting and has the ball pop up high, but this racket can certainly make a good adjustment for them. The backhand feel is kind of different with a forehand which I think they must have put some kind of liquid in there. This is important for beginners because you not only developing your playing skills even your techniques may not always be perfect, so it is good for you to have a bat like this Palio Expert 2 to assist you a little bit in sharpening up your overall skill. By having this bat, it can help you to increase your accuracy and also help to keep more balls on the table. The racket will not give you the spin that great when compared to the professional racket. But it still will give you enough spin that you are looking for. I tried and it can really give me powerful spin when I make topspin shot. The bottom is quite tacky which really do hold the ball nicely. You may be surprised on how easy it was to play fast spin ball with the bat. This is not a fast paddle, but it is quite okay for most people as it is not too fast but not too slow either. If you are a beginner you really don’t need a fast racket which you may not fully exert it. I found a lot of beginners try to get a carbon paddle when they start playing the game of ping pong. This is not the ideal one as they will miss the opportunity to develop any control or feeling over the ball when they start learning to master the game. What I like about this 2nd generation of Palio Expert racket is that it doesn’t give me any hollow feeling nor produce any irritating vibration. With these advantages, it easily winning over all other paddles of the similar price range. The blade has a long handle and is designed for shake hands grip. The handle that constructed of flared wood can give you a quite good feeling when holding it. It is heavy enough to give you a good balance of weight. I try to get a ball and hit on the bat to see how many time the ball can bounce. I tried for a few times and the average bounce that I got was 4 to 5 which was quite good as compared to the Palio Expert 1 which only gave me about 3 bounces on average. Some drawbacks I found on this bat is that the rubber is not properly attached to the wooden frame. It seems like going to lose after some time of playing. The Palio CJ8000 rubbers are the same rubber with the Palio Expert 1. This is an excellent quality bat that you can get with a very reasonable price. You are going to impressed with the amount of spin that this bat can generate. If you want to play consistent loops with your game, this bat can help you to do so with effortless. This is also an ideal bat that you can make use of it to practice new techniques and strokes. If you can’t make a good spin when playing the game with your racket, then you can consider getting this one. By having this bat, you will be able to learn to do a spin on the ball very fast. 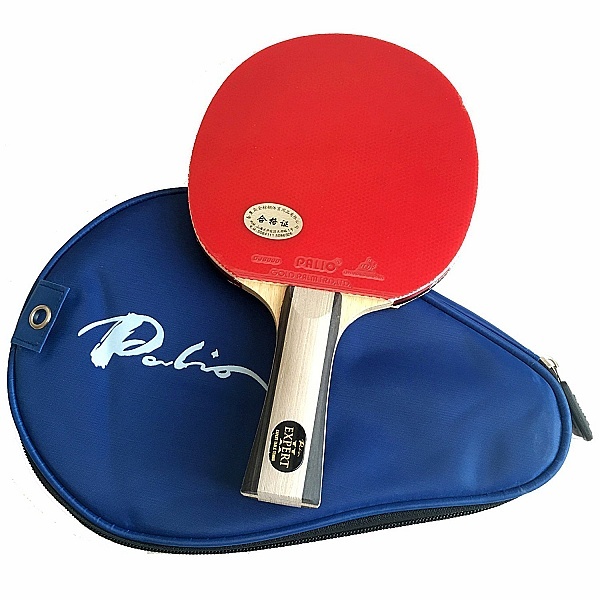 Other than this Palio Expert 2 racket, there are still many different table tennis bats that may suit your need, you can read on it and figure out the best one for you. It is not like other pre-made rackets where you are not able to change the rubber. The rubber for this bat is replaceable. If you do not like the rubber that comes with this racket, you can remove it and replace with the rubber that you like. If you like this racket, you can get it from Amazon. There is a free table tennis case that comes together with this racket, so you no need to spend money on buying the case to keep the racket. And the case is specially designed to fit well with the racket.